There’s almost nothing better than a gooey, decadent, top-notch grilled cheese sandwich. And chef Nancy Silverton’s take on the classic? Well, that’s on another level—and thankfully, she’s leveling-up availability for Angelenos starting this week. The La Brea Bakery founder clearly knows her way around fresh bread, and in her days at Campanile, her grilled cheese nights reached cult-classic status before the restaurant’s closure. Then, essentially, they disappeared. 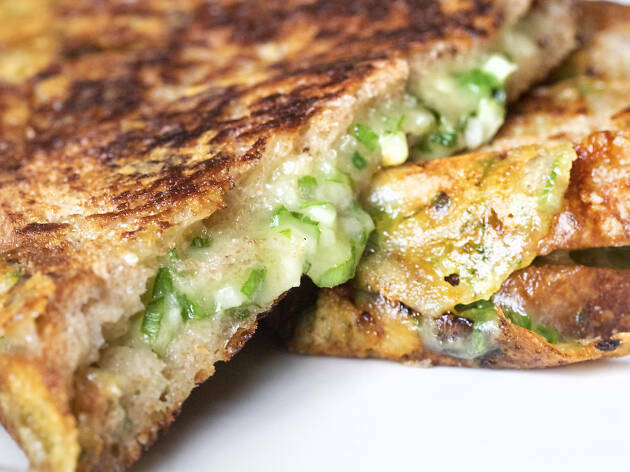 The Mozza magnate and James Beard Award winner recently reentered the grilled cheese game, sliding grilled cheese sliders onto her late-night menu at the end of 2018, and with a glorious, one-night-only, full-sized revival at République’s anniversary party (a nod to the space’s former tenant, Silverton’s Campanile). 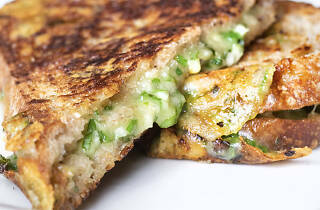 Until this week, the only way cheese enthusiasts could taste the chef’s sandwiches was during Pizzeria Mozza’s late-night, and the only option available was the Ruth’s Grilled Cheese—named for author, editor and food TV host Ruth Reichl—made with white cheddar, scallions, shallots and aioli. But now, the sliders are going full-size, and yes, you can still get the Ruth’s ($15, or $16 with bacon), along with Nancy’s beloved version, now called the Classico ($15), with cave-aged gruyere, onions and whole-grain mustard. New variants include the Signore ($16), made with gruyere, proscuitto cotto, béchamel and parmigiano; the Signorina ($18), with gruyere, proscuitto cotto and an olive-oil–fried egg; and the Peperoncino ($15), full of smoked gouda, cheddar, peppers, pickled celery and fried celery leaf. And because Silverton’s one to kick things off in style, the new late-night focus is getting a collab thanks to Off the Menu Club, whose subscribers get early access on Tuesday; non-members of the off-menu–specials app can find it on Thursday, when SLAB and Trudy’s Underground Barbecue’s Burt Bakman will team up with the Mozza queen for special brisket grilled cheese sandwiches packed with grilled onions, mustard, gruyere and caraway, from 9pm until they’re gone. Got a sweet tooth? There’s also a new late-night dessert—a torched Meyer lemon meringue coppetta ($14)—plus a champagne-by-the-glass special at $15. Us? We’ll probably just be doubling or tripling up on grilled cheese. After all, it’s fine to finish a meal with a cheese plate—so let’s just pretend a third grilled cheese is one of those and skip the side-eye, thank you very much. Pizzeria Mozza is located at 641 N Highland Ave. Find the grilled cheese menu at the bar from 10pm–midnight Sunday to Wednesday, and all day on Thursdays.